The importance of collaborating with other genealogists researching your ancestors cannot be overemphasized. You will find that you have many distant cousins that share your interest in family history. Don't be afraid to contact people that connect with you and ask them for information. Recently I have entered into a very successful collaboration with a group of cousins who are researching the Eggert family that hails from Steimke, Saxony, Germany. My thanks to Kathi Appelt, Ellen Dinges and other members of the family who have helped me compile the following information. 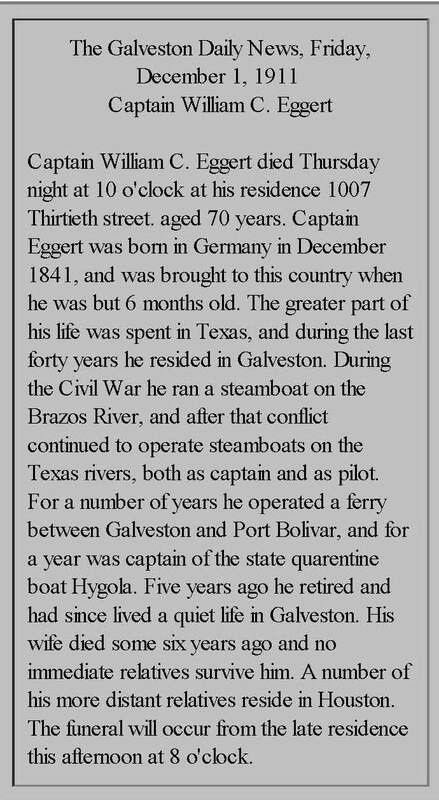 One particularly interesting member of the Eggert Family is Captain William C. Eggert AKA Christian William Eggert who was a pilot and a ship's captain in Galveston and on the Brazos River in Texas. 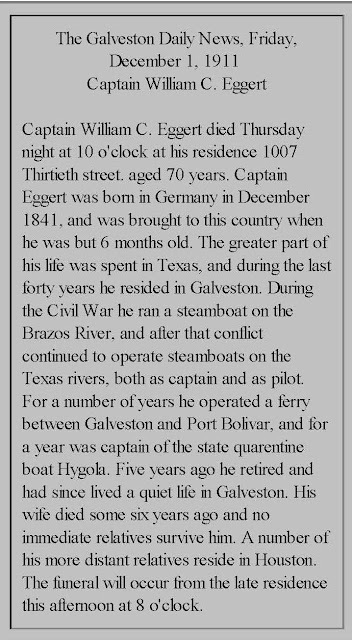 The obituary of Captain Eggert gives us an overview of his life. This record is from an online database at Ancestry.com. 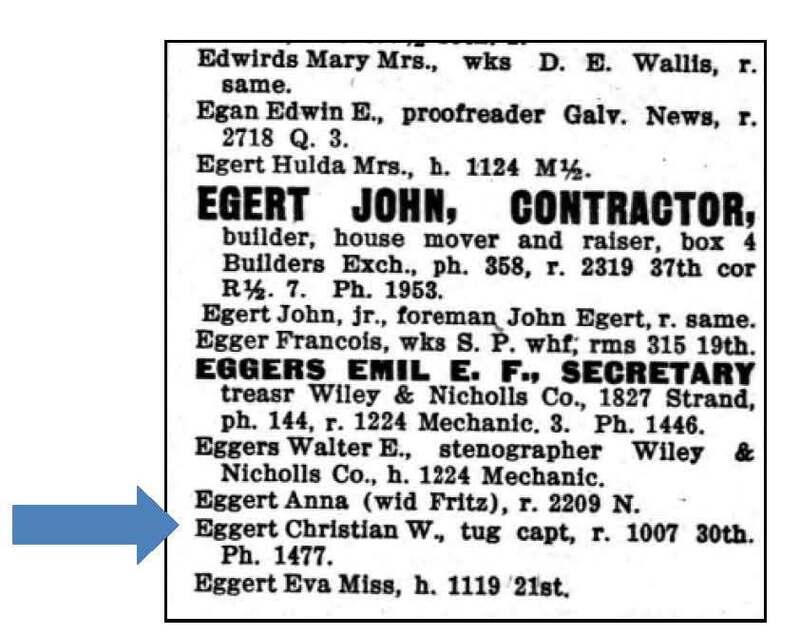 The original data was from Ethel Hander Geue. A New Land Beckoned: German Immigration to Texas, 1847-1861. Baltimore: Genealogical Publishing Co., 1982. Ms. Geue transcribed data from passenger lists into her book. In the family of Jac. and Soph. Eggert you see there is a five year old boy named Wm. presumably an abbreviation for William or Wilhelm. We believe that this is Captain Eggert. Jac. could be an abbreviation for Jacob. Some genealogists have his name as Joachim. Soph. is presumably an abbreviation for Sophia. When Judie Cale Nelson made this transcription back in 2000, her reading of the passenger list led her to assume that all of the passengers were going to Texas. Ms. Nelson paid particular attention to the names of the villages that were listed as the place of origin for these immigrants. This is very rare to find the names of the hometowns on a passenger list. The transcription by Ms. Nelson is very helpful because it provides geographic context for the location of the villages of this group of German immigrants. 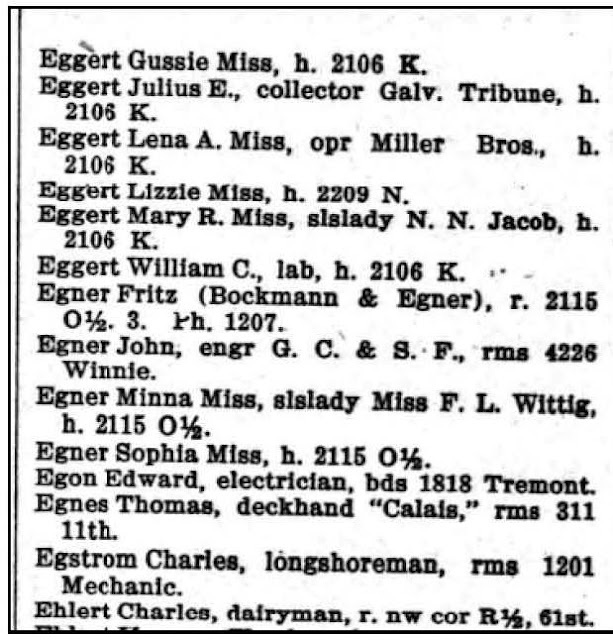 The two Eggert families on the passenger list came from Brome and Steimke. According to Ms. Nelson, the villages of Brome, Steimke, Parsau, Apenburg, Ahnebeck, Jübar and Germenau are all near each other and located NE of Braunschweig also known as Brunswick. These places are also close to a place named Wolfsburg which you may recognize as the location of the Volkswagen headquarters and the largest car plant in the world. There is another village named Steimke NW of Brome. 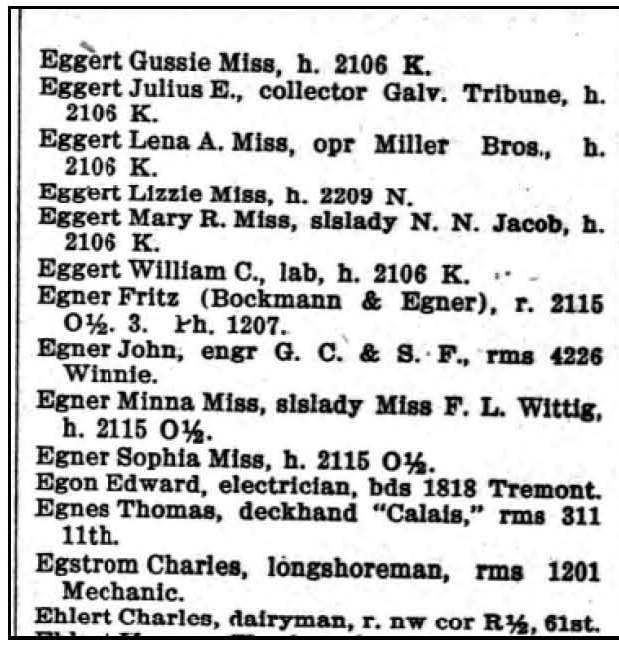 The names on this passenger list bear further scrutiny as they become part of the FAN club [Friends, associates, neighbors] for the Eggert family. (Clayton Library), Under Three Flags, Register of Veterans of All Wars, 1839-1889, pg. 48, #315. copyright 1996, George Washington Chapter, National Society Daughters of the American Revolution, c/o Mrs. Rose Mary Fritz, 5001 Casa Grande, Dickinson, TX 77539-7504. The Houston Post, Sunday, December 30, 1962, by Gayle McNutt, page 9, Section I, "Battle of Galveston." "...Magruder decided to move up the attack to the night of Dec. 31. Still it was to come as no surprise to the Union forces. Sharpshooters were needed to man the cotton-clad Confederate steamboats and Magruder issued a call for volunteers that was answered by members of Sibley's and Green's Regiments, who were promptly dubbed "horse marines." 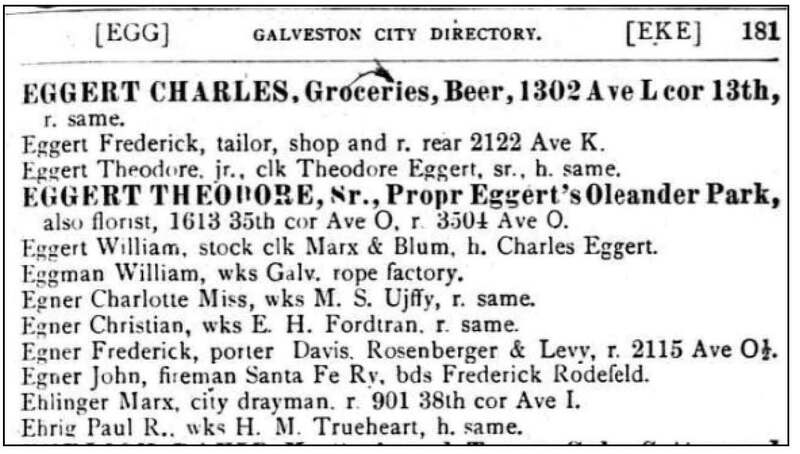 Col Tom Green led the sharpshooters, who volunteered with the understanding that it was a mission from which they were not likely to return..."
The following chronology from the Galveston City Directories for Eggert from 1866-1912 shows that Captain Eggert first appears in Galveston in 1874. 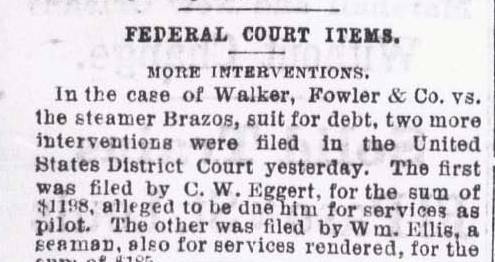 This would mean that he resided in Galveston for 37 years until his death in 1911. 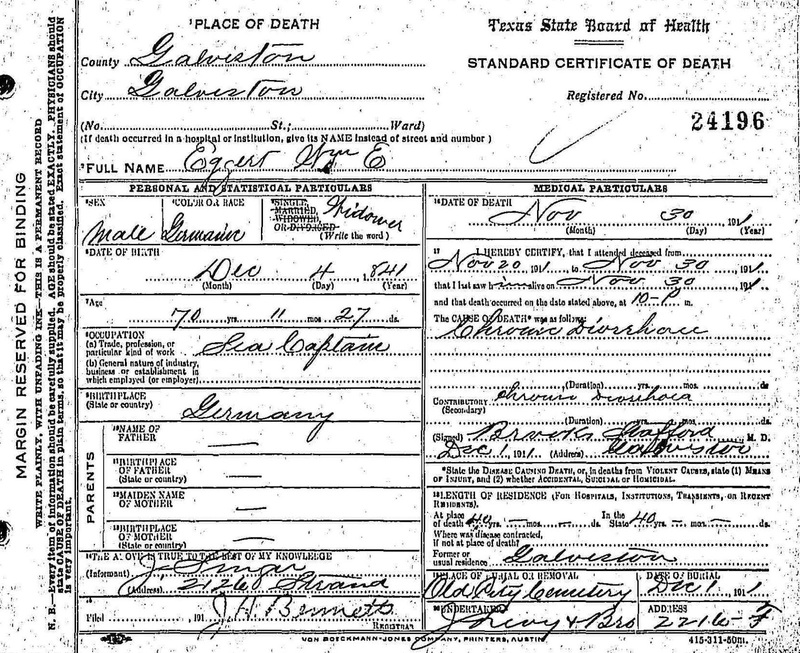 The obituary states that he resided in Galveston for forty years. No listing for Captain Eggert in 1866. 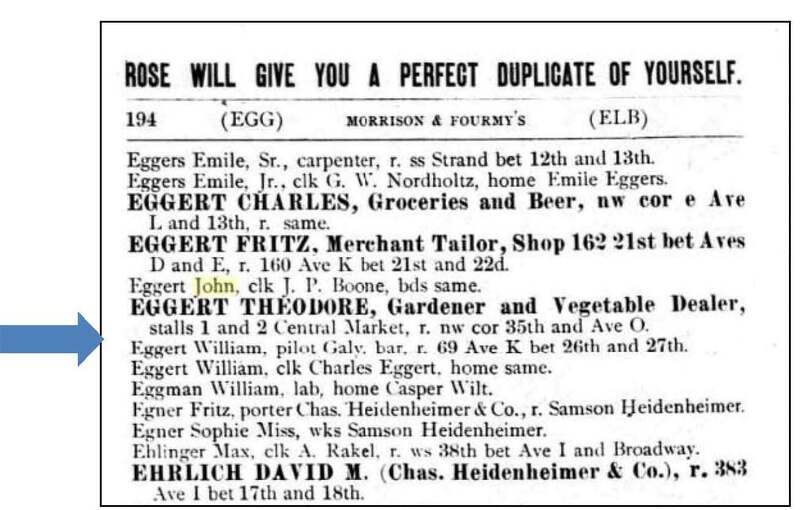 No listing for Captain Eggert in 1868. 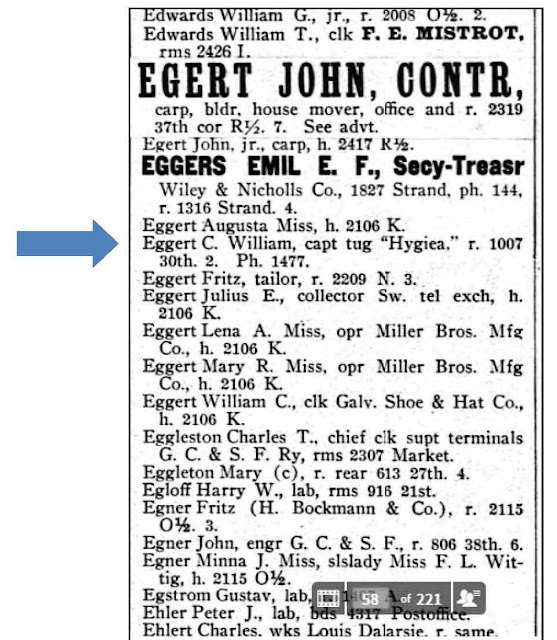 No listing for Captain Eggert in 1870. 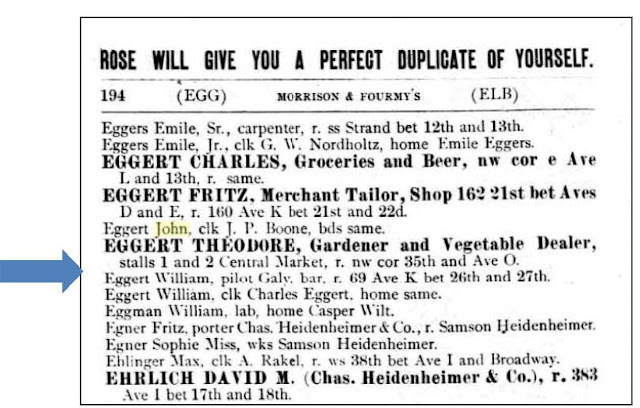 No listing for Captain Eggert in 1872. 1874 Shows the first listing for William Eggert as a pilot residing on Avenue K between 26th and 27th Street. 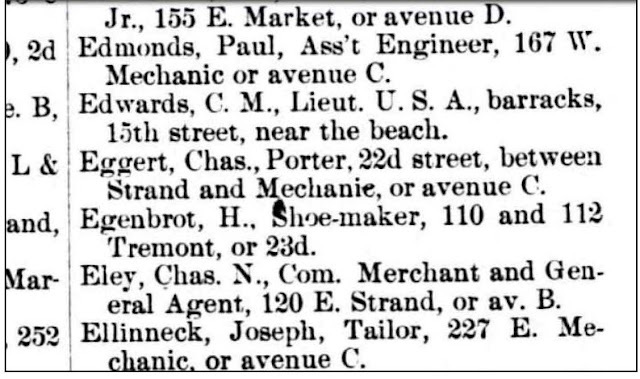 Again he is listed in 1877. For some unknown reason he was not listed in 1880. He shows up again in the directory for 1882 at the same address where he was found in 1874 and 1877. He arrives at his 30th street address in 1886. 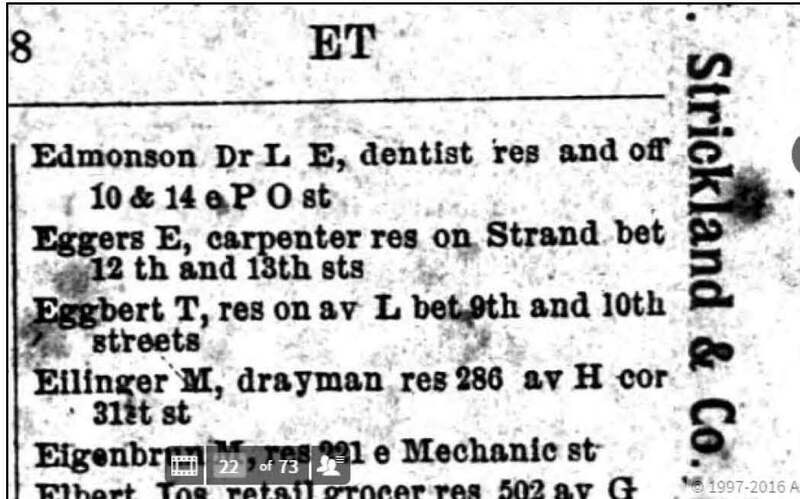 He shows up again on 30th street in 1890. The 1890 Tax List of Galveston Precinct No. 1 shows that C.W. Eggert owned Lot 7, Block 150 valued at $1300. Based on Galveston Appraisal District records that description is consistent with an address of 1007 30th street. There is a current property listing in Appraisal District records for 1011 30th street which is described as Lot 8 of Block 150. Lot 7 appears to have been merged into a commercial property on the corner of Broadway and 30th Street. 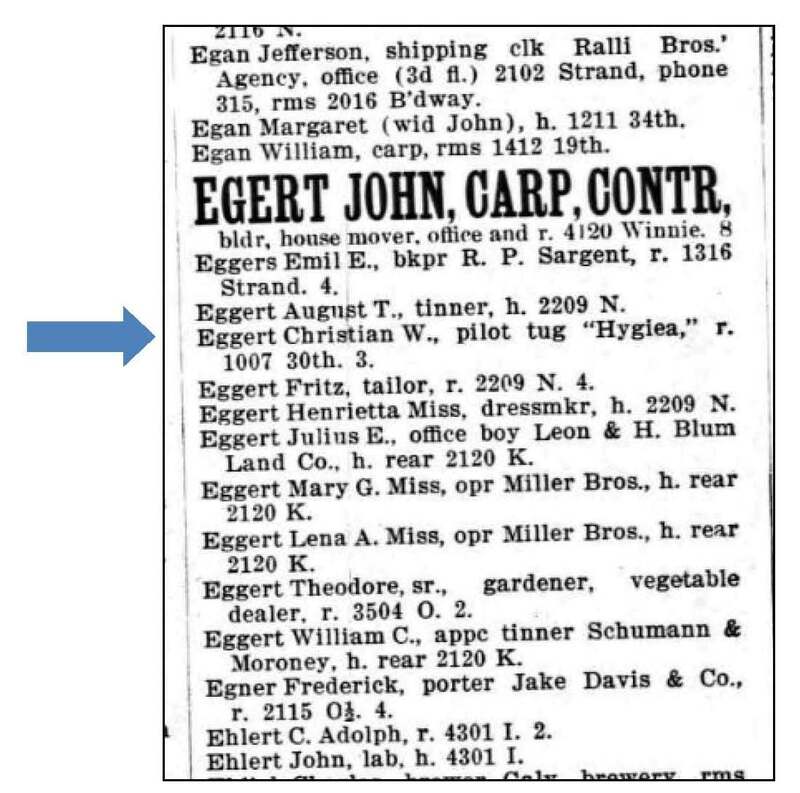 The house of Captain Eggert was apparently razed for a fast food restaurant which is now serving as a title loan business. SOURCE: "Texas, County Tax Rolls, 1837-1910," database with images, FamilySearch (https://familysearch.org/pal:/MM9.3.1/TH-1-13738-34687-41?cc=1827575 : 22 May 2014), Galveston county, Precinct no. 1 > 1890 > image 103 of 386; State Archives, Austin. There were two pages of Eggerts in 1893. But William Eggert, the captain and pilot did not appear. 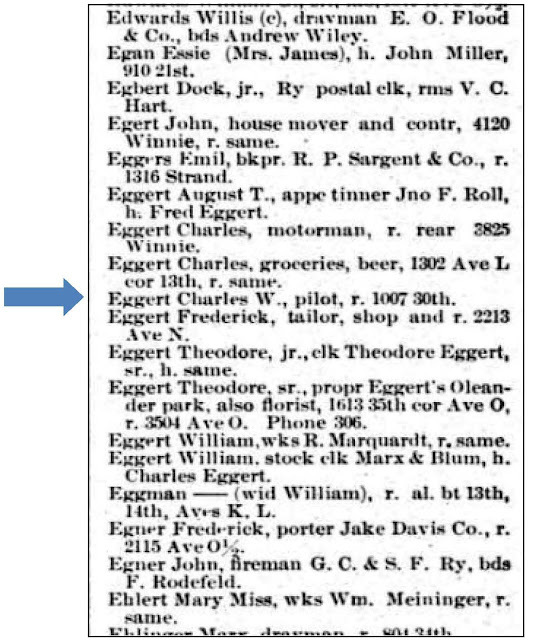 In 1895, Captain Eggert resided at 1007 30th Street and as you will see he continued to reside there for the rest of his life. 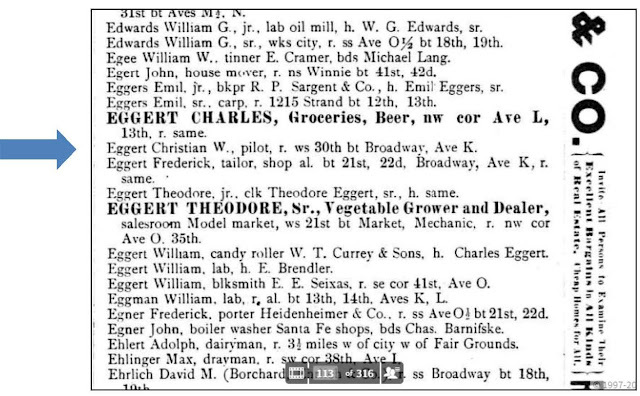 In 1901 he is listed as the pilot of the tug "Hygeia." In 1905 he is the captain of the tug "Hygeia." 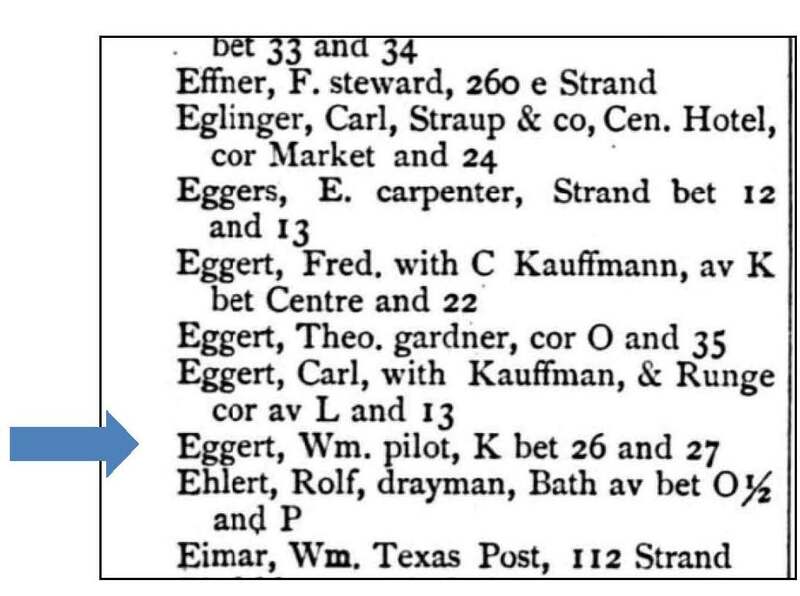 1911 he is again listed as a tug captain. The information on the death certificate for William C. Eggert was provided by a Mr. J. Singer of 2126 Strand in Galveston. 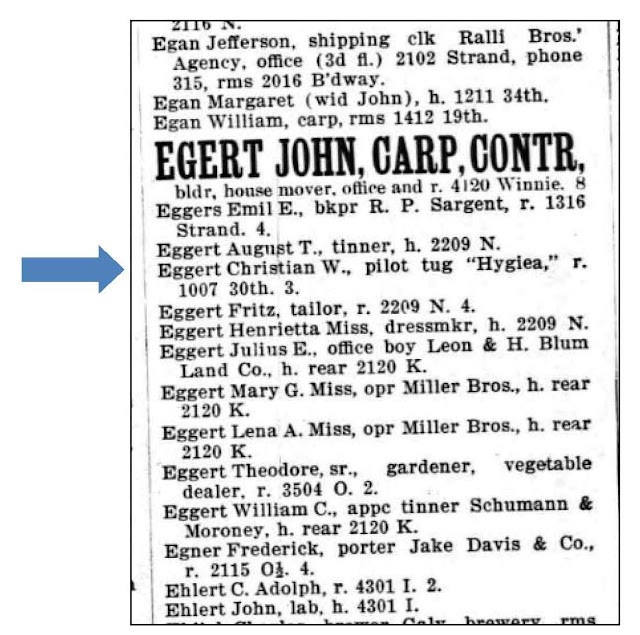 Captain Eggert died on November 30, 1911 and was buried in the Old City Cemetery. The doctor that attended Captain Eggert in his last hours was Dr. Brooks Stafford. Mr. Singer gave the first name as William E. rather William C. He also stated that he was born December 4, 1841 in Germany and that he was a "Sea Captain." The length of his residence in Galveston was 40 years. This record gives his birthplace as what appears to be Letzinger, Saxony. His address matches with the city directory. It is also noted that he had no direct issue. There is a place called Letzlingen in Saxony which is in the vicinity of Steimke and Brome. Letzlingen is a village and a former municipality in the district Altmarkkreis Salzwedel, in Saxony-Anhalt, Germany. Since January 1, 2011, it is part of the town Gardelegen per Wikipedia. 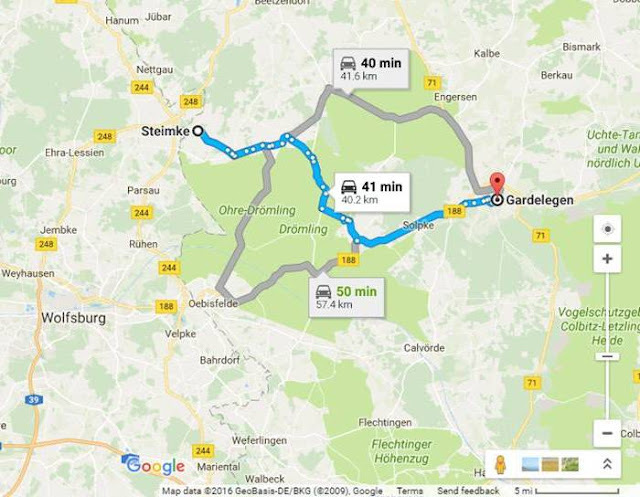 Here is a map of the route from Steimke to Gardelegen. 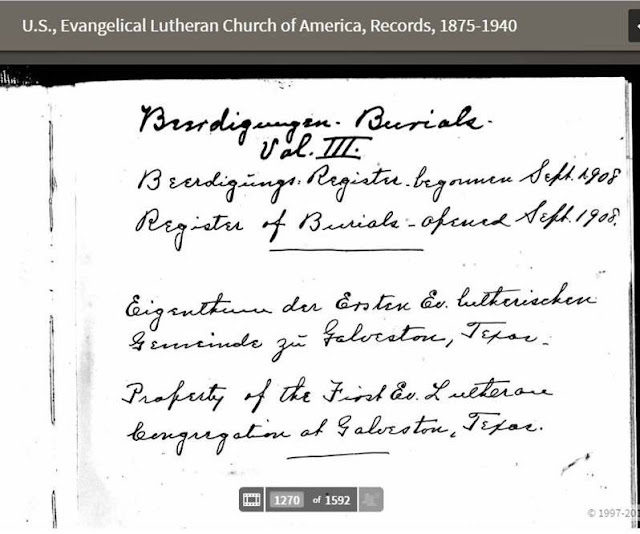 These were the burial records of the First Evangelical Lutheran Congregation of Galveston, Texas which are now available on Ancestry.com in a database entitled U.S., Evangelical Lutheran Church of America, Records, 1875-1940. To trace the story back further, we will need to consult some of the German parish records in this part of Saxony. Parish register transcripts of baptisms, marriages and deaths for Steimke, Sachsen, Preußen, Germany for the period 1823-1860 are available on Family Search microfilm number 1190638. This parish also includes Brome, Cunrau, Germenau, Fahrstedt, Bökevitz, Nettgau, and Wendisch Brome. Captain Eggert filed an intervention in the case of Walker, Fowler & Co. vs. the steamer Brazos, suit for debt. C.W. Eggert filed for the sum of $1198 alleged to be due him for services as a pilot. Perhaps if a court case file can be located, it will describe the nature of his services in greater detail. (https://texashistory.unt.edu/ark:/67531/metapth467806/m1/8/: accessed October 15, 2016), University of North Texas Libraries, The Portal to Texas History, texashistory.unt.edu; . In summary, it is always helpful to collaborate with others in your genealogical pursuits.